A full tracklist of Black Pink's new EP album has been released. It also confirmed worldwide release on April 5 at midnight the sametime. 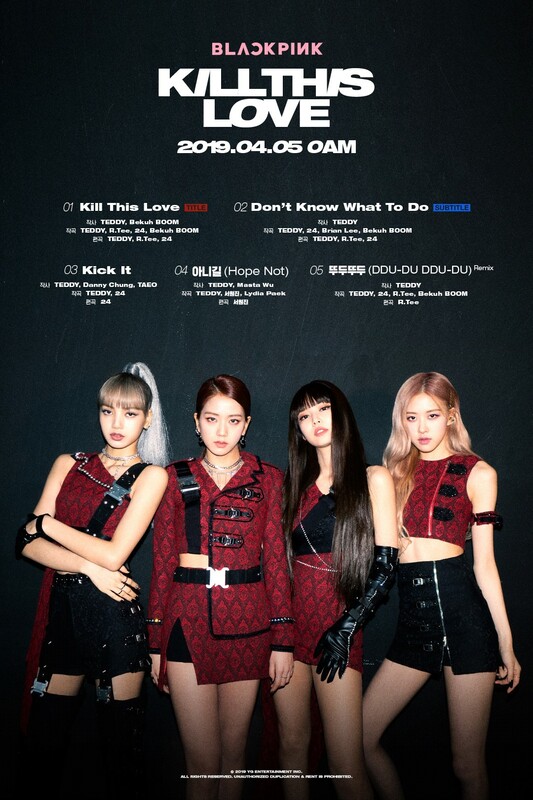 YG Entertainment released a poster containing a tracklist of the entire album "KILL THIS LOVE" on their official blog at 9 a.m.(local time). The Black Pink in the poster is a look with an pattern that exudes a strong charm of girl crush. The teaser officially announced that Black Pink's new EP album is released at midnight on April 5. Most of the new releases have been unwritten since the local music charts were revamped at 6 p.m., but Black Pink exceptionally confirmed the 0:00 release for simultaneous worldwide releases. At the request of Universal Music Group in the U.S., the decision was made to target not only the domestic but global market. The Black Pink title track "Kill Dispatch Love" is the main theme of strong lead sound and grand drum. On top of that, Black Pink members' rap and vocals penetrated, clearly capturing the unique color of Black Pink's music. The participation are TEDDY and top producers, who have been with Black Pink since their debut. The lyrics for "Kill This Love" included TEDDY and Bekuh BOOM composing, TEDDY, R.Tee and 24. In addition, the company will introduce a much richer music spectrum with songs such as "Kick It" and "Hope Not." You can also meet the remix version of the global sensation "DDU DU DDU DU." Black Pink grew into a global girl group representing K-pop through their first mini-album "SQUARE UP" last year that included "DDU DU DDU DU" Fans around the world are paying attention to what kind of transformation Black Pink may have made with its new report "Kill This Love." Especially, the news of Black Pink's recent release of "Kill This Love" has been highly anticipated in the U.S. ahead of its full-fledged entry into the country, featuring a large display board of the Beverly Center in Los Angeles, California. Black Pink also has emerged on the electronic display board of the huge Beverly Center, known as a landmark in Los Angeles, has been making headlines by chatting on various social networking sites. Since the release of "Kill This Love" on 5, BLACKPINK will be on stage on 12 and 19, the biggest music festival ‘Coachella Music Festival’ in the U.S. Starting from 17, they will start on a tour of North America, which will start in Los Angeles, six cities and eight performances, to visit fans around the world fans.